To save you a lot of time, you can perform mass download from Pics.io, i.e. to download more than one asset at a time. to select individual files that are not in sequence, hold down Cmd (for Mac OS) / Ctrl (for Windows) on the keyboard and select each file you need with the left click of the mouse. press Cmd (for Mac OS) / Ctrl (for Windows) + D.
Please note that you can’t download more than 300 files at a time. As you download your assets, you can convert the file formats (for RAW, PNG, PSD and JPG only) to download them as jpg/png/pdf files rather than their original format. You can also choose to download them as an archive or as separate files. 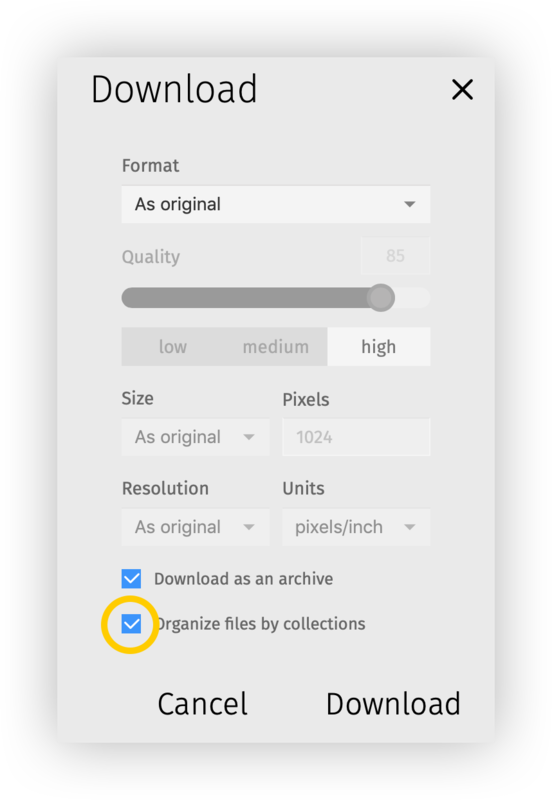 After the Download window appears, choose “Download as an archive” and “Organize files by collections” as it is shown on the screenshot below. If you have any issues with downloading assets from Pics.io library, please make sure you have no add-ons or plugins (e.g. Adblock or uBlock) added to your browser and try to reload the webpage. In case the problem still appears, please contact us via chat or at support@pics.io with more details and we will be happy to help.